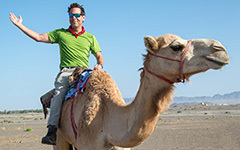 W&M just finished its graduation celebration, and, as is a yearly tradition in the days after graduation, the Geology Department’s Regional Field Geology course (GEO 310) is off. This year we are headed in a different direction – as we’re traveling north by northeast to Norway, and we’ll be north of the Arctic Circle in the Lofoten Archipelago. 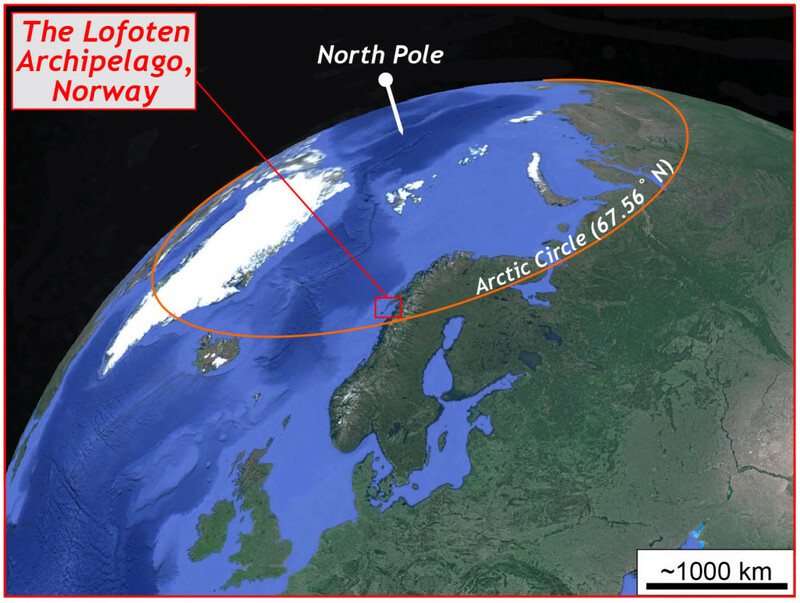 Lofoten and the Arctic Circle. By May 20th, if all travels go according to plan, we’ll have 16 William & Mary Geology students and 2 faculty members safely in Lofoten by the time the sun sets. At this latitude, and at this time of year, the sun sets late – well after 11 p.m. local time, and it rises early. During these short Lofoten nights the sun is just below the horizon and twilight rules. Back in Williamsburg, the days have grown long, but nighttime is still nighttime. In Lofoten, with each passing day, the day length will grow noticeably longer, and before the trip ends we’ll be basking in the midnight sun. 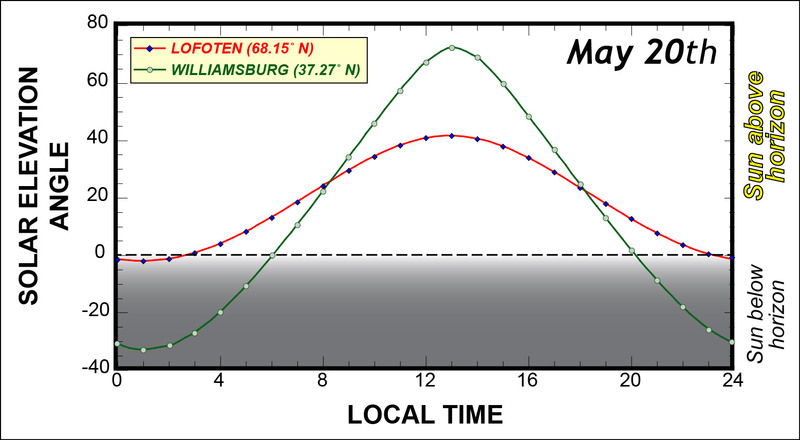 The solar elevation angle for May 20th in Lofoten, Norway and Williamsburg, Virginia. At local noon, the sun is at a higher angle above the horizon in Williamsburg (~73˚) than in Lofoten (~42˚), but the day length is much greater in Lofoten and the nighttime hours are really twilight hours as the sun is only a few degrees below the horizon. Which locale receives more insolation on May 20th? Vågakallen (elevation- 943 m) rises steeply from sea level in Lofoten, Norway. Click on the image for a bigger view. The region offers up spectacular alpine scenery surrounded by the sea, and its diverse geology is worth the 6,000 kilometer journey across the North Atlantic. Temperature-wise it’s the world’s warmest locale north of the Arctic Circle, all thanks to the moderating influence of the North Atlantic Current. My colleague Nick Balascio is conducting paleoclimate research here, and crafted a plan for a new W&M field course. There will be much geology on this trip – we’ll see the work of glacial erosion and deposition, we’ll debate the origin of strand flats and track sea level changes during the Holocene, and for the hard-rock aficionados we’ll delight in charnockites and eclogites. Moussa Dia, Eve Pugsley, and Katie Valery will be collecting field data for their Senior Research projects while we roam over Lofoten. 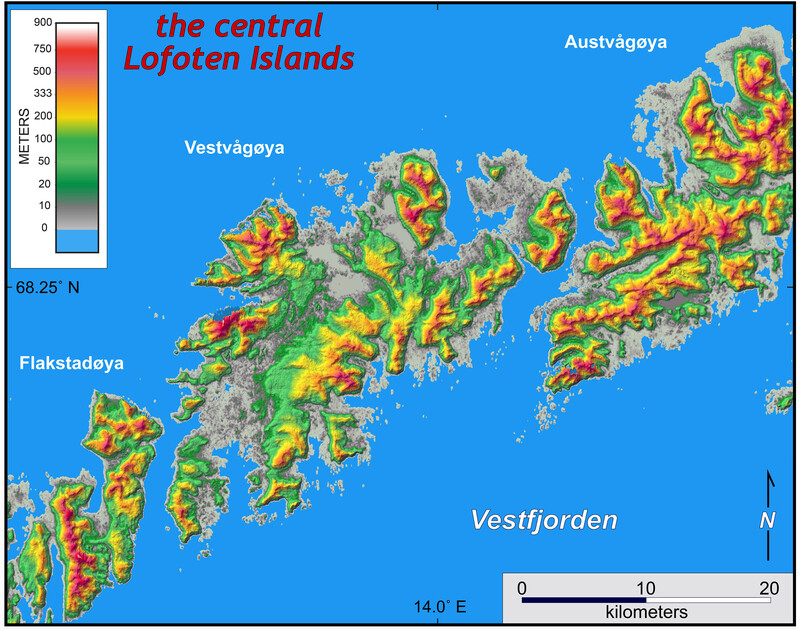 Shaded relief map of part of the Lofoten Archipelago. Note the rugged alpine topography (the yellows and reds), but the islands also have large tracts of low-elevation flat terrain (the grays). 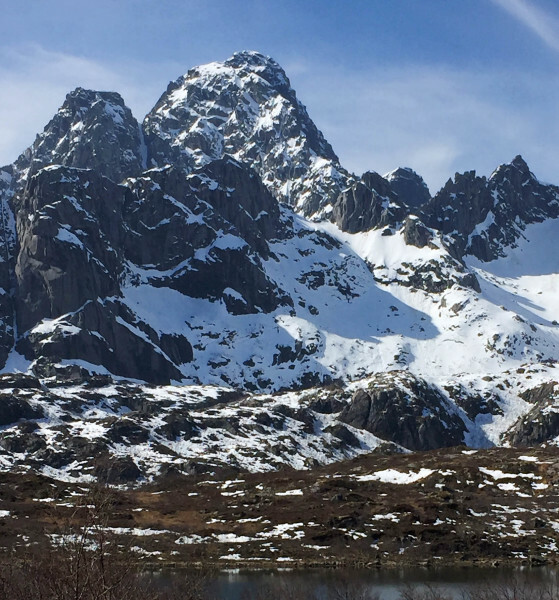 What factors have created the Lofoten landscape? Click on the image for a much more detailed view. Check back for updates as the trip unfurls. SO COOL! I did my senior research project on Svalbard (via REU) and it shaped the next few years of my life. Wish I could come along with you guys! Nice graphics Chuck! I like how Vågakallen pays homage to the Williamsburg Solar elevation angle graph 🙂 bet it was an amazing trip… on to the next post.